159(A) (24 May 1944), 162, 164, 165, 167, 169, 170, 171, 172, 174, 175, 176(S), 179, 180, 181, 182, 187(AS), 189, 190, 192(A), 194, 195, 196, 197, 198, 204, 205, 206, 207, 208, 210, 213, 216, 217, 218 (4 August 1944). (A) Non credited abortive mission -- (AS) Credited abortive sortie - no bombs dropped. (S) Non Credited - Spare aircraft - not required returned to Molesworth. For Mission dates, targets and Mission Reports, see Combat Missions. 1Lt William J. Arnold (P) - Dispatched on 38 missions (35 credited). First two missions with Combat orientation crews- #159(Aborted) - 1Lt Clinton N. Moser Crew, #162 1Lt Edwin H. Assenheimer Crew. All other missions flown as First Pilot. 35 mission combat tour completed on 4 August 1944. 2Lt Maurice V. Altman (CP). 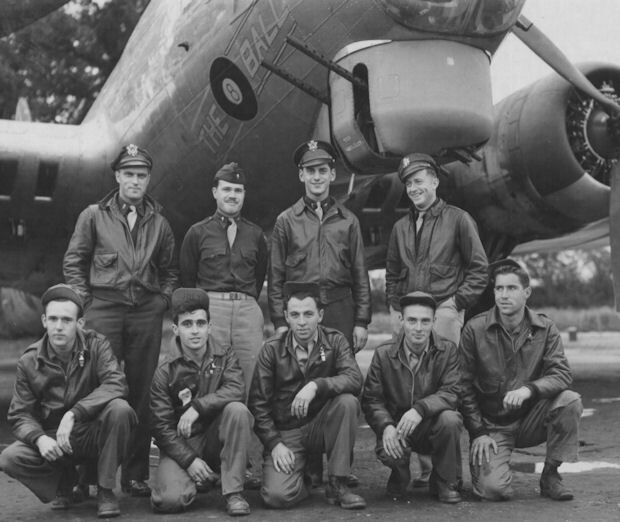 Dispatched on 36 missions (35 credited): As CoPilot with 1Lt Arnold Crew - 15 credited missions (164, 165, 167, 169, 170, 171, 172, 174, 175, 176(S), 177, 179, 180, 181, 182(AS), 196); As Copilot with other crews - 1Lt Russell W. Meier Crew (187), 2Lt Graham C. Gould Crew (200), 2Lt John M. Reed Crew (189, 190, 191, 194, 195, 205, 206). Upgraded from CoPilot to Pilot on orders dated 20 July 1944. Flew 11 missions as First Pilot with F/O Paul E. Zimmerman (CP) and other members of the 1Lt Allan W. Langford Crew. 35 mission combat tour completed on 24 August 1944. Other seven Crewmen: 1Lt Stanley M. Claster (N), 1Lt Ellsworth B. Callahan (B), T/Sgt Robert M. Williams (E), T/Sgt Joseph A. Moreira (R), S/Sgt James D. McClure (BTG), S/Sgt Ralph W. Lichtenwalter (WG), S/Sgt John M. Surrell (TG) - Stood down on missions 159(A) and 162. Flew on all other 1Lt William J. Arnold's missions. Thirty-five mission combat tours completed on 4 August 1944. B-17G 42-31483 Bonnie B (BN-P) Twenty-Eight missions (All missions other than (159, 162, 192, 198, 205, 213, 216, 217). "Bonnie B" was named after the six month old daughter of Lt G. Neil Bech, Jr. (P). Crew Chief M/Sgt William Zachar. Sgt John Surrell (TG) on the 1Lt Arnold Crew, named his daughter, born in August 1945, Bonnie after the Bonnie-B B-17. Mission #210, 23 July 1944 in B-17G "Bonnie-B" to Creil, France. Bonnie B's gas tanks began to run dry while headed home and nearing the English Channel. Two engines conked out and the other two engines began sputtering as Bonnie-B approached the English coast. 1Lt Arnold landed at a Polish exile fighter base adjacent to the beach and ran completely out of gas on the runway. After being partially refueled the crew flew to the nearest US base at Ford, West Sussix, England, spent the night at Ford, and returned to Molesworth on the next day, 24 July 1944. An easy six-hour mission to France almost turned into a disaster. Officials at Molesworth decided to only partially fill the gas tanks of the B-17s apparently to save fuel for longer trips. The Arnold crew took off at 3:11 p.m. aboard the Bonnie B along with 37 other planes. They bombed through cloud cover using the British GEE-H ground stations to obtain the bomb release navigation position. Stanley Claster described it as a "lousy bomb run" in his notes, probably because of the weather. Afterwards, the Arnold crew encountered meager but accurate flak while flying over Rouen. The partially filled gas tanks began to run dry while the Bonnie B was headed home over the English Channel. Two engines conked out and the other two engines began sputtering as the plane approached the English coast. Arnold headed for the nearest landing field he could find, a Polish exile fighter base located adjacent to the beach. The captain ordered the crew to put on their Mae West life jackets in case they had to ditch in the water. John Surrell recalls Stanley Claster saying over the intercom, "just a few hundred more yards." Luckily, Arnold was able to land the B-17 safely on the short runway before completely running out of gas. Just like when they landed at Nutt's Corner, Northern Ireland, base officials had to send a fuel truck out onto the runway to supply enough gas so Arnold could taxi off the landing area. The crew enjoyed talking to the Polish airmen. John Surrell remembers Stanley Claster telling the Poles that the first place the Arnold team bombed was Posen, Poland. Other crew members suggested he change the subject since some of the Polish servicemen might have been from Posen. After the Bonnie B was partially refueled, the crew flew to a nearby US bomber base at Ford. The Arnold team spent the night there, and flew back to Molesworth the next day. Official records indicate five other planes in the formation also landed at other bases in England because they ran low on fuel. Another B-17, with No Name, ditched in the English Channel, but the crew was rescued. Two crewmen aboard the Paper Dollie died from injuries sustained while bailing out over Southern England when the crew could not find a place to land before they ran out of gas. The plane crashed at Bishop's Waltham. The Bonnie B (A/C# 42-31483) began her career on January 1, 1944 with the 303rd Bomb Group, 359th Bomb Squadron. She wasn�t one of those silver, fancy jobs. Rather, she was olive drab, a real workhorse. But one thing you had to say about her; if she took you out, she brought you back. The Bonnie B acquired her name from a pilot named Bech who had a six month old daughter named Bonnie. The name must have brought good luck because she flew 93 missions and aborted only seven times. Between May 29, 1944 and August 4, 1944 the Arnold crew flew a total of 33 missions. Twenty seven of these missions were in the Bonnie B, twice coming home on three engines. The crew owed a debt of thanks to the masterful hands of her crew chief, Master Sergeant William Zachar. She would come back from a mission with an engine feathered and numerous flak holes in her wings and fuselage. Crew Chief Zachar would have her ready to fly the next day. His crew probably worked all night to fix the engines and patch the flak holes, but she would be ready to go by mission time. Crew Chief Zachar was a man of many talents. Besides being a top-notch airplane mechanic, he also did dry cleaning on the side, as Lick, the waist gunner, and I were to find out. The sergeant told us when we returned from leave in London to bring our official duty uniforms for cleaning. Bill took a five gallon can and filled it with 100 octane aviation fuel and proceeded to rinse our uniforms up and down with gasoline. Much to our surprise they came out spotless. Needless to say, we did not light any matches around them for a week! Bonnie B�s last mission was on September 5, 1944 to Ludwigshafen, Germany. She lost a propeller and with two engines out, landed at an emergency strip, A62, near Paris. On September 9, 1944 she was salvaged for parts. What a sad way to end her career! Shortly after returning to the States in October, 1944 I was married and my daughter was born in August, 1945. Yes, I named her Bonnie after our bomber.